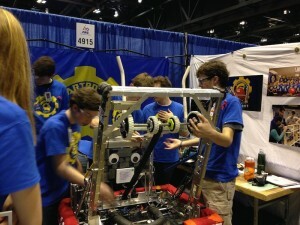 ATLaS (Advanced Tele-operated Launching System) was our first competition robot, was built for the FRC game Aerial Assist. For more information on Aerial Assist visit the FIRST website. 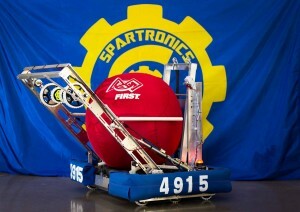 Build season for ATLaS started on Jan. 4, 2015 and lasted 6 weeks. ATLaS operated with an intake, drive train, and launcher. Half of the wheel fasteners on the intake wheels are made out of aluminum and half of them were printed by our Makerbot Replicator 2x 3-D printer.